The US 2nd Infantry Division has fought hard to establish headquarters in the small Belgian town of Wirtzfeld, but a major German counterattack is imminent. US troops already across the border in Germany are at risk of being cut off, stranded deep in enemy territory as the Nazi forces advance. The men of the 2nd Division Military Police Platoon, Pfc. James D. Edwards among them, are not infantrymen, not accustomed to fighting on the front lines—but they take up defensive positions as the German armor moves in. Their unwavering dedication to the cause is about to alter the course of history. . . . This decisive battle is just one of the many moments documented in the pages of this extensively researched visual history. Never-before-seen photographs from the private collections of Pfc. James Edwards and his fellow MPs offer a vivid glimpse of the war. Letters and one-on-one interviews illuminate their journey. Documents and military reports shape the movement of battalions and armies. 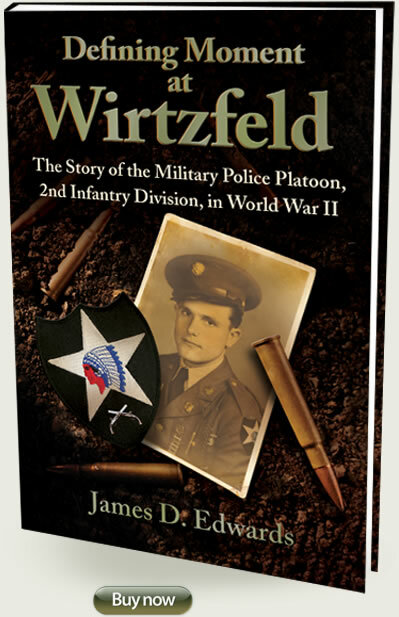 Defining Moment at Witztfeld is an extraordinary testimony to the struggles and triumphs of the 2nd Division Military Police Platoon in World War II. Visit my FB page to view over 100 photos not included in the book. © 2013 James D. Edwards. Powered by Brown Books Digital.